Aban Offshore Will it succeed? You are here: Home / Analysis / Aban Offshore Will it succeed? 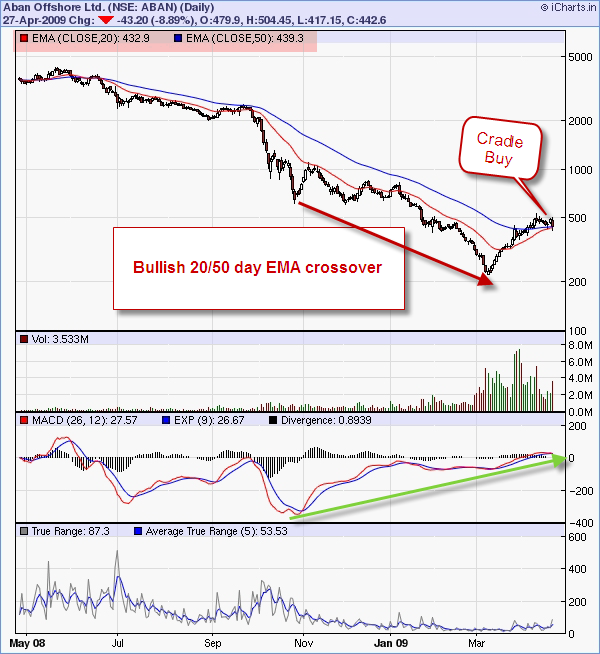 Bullish 20/50 day EMA crossover in Aban on daily charts. Its a crade buy with stop loss 425 on EOD basis. Aban Offshore has announced its fourth quarter results. The company's Q4 consolidated net loss stood at Rs 93.04 crore versus net profit of Rs 33.92 crore. Its consolidated net sales were up 16.99% at Rs 774.08 crore versus Rs 661.64 crore and operating profit margin, OPM improved to 55.72% versus 50.65%. Its Time for Technicals Versus Fundamentals. now 10day sma trin of nifty touch to 1 its sign of down turn of market be caceous. Sir, I stell holds ABAN … What should i do, whether book loss or average at lower levels ?